Since inception in February last year, Arise has delivered on its mandate of promoting financial inclusion in Africa and celebrated a record first year of operations with a profit of USD 53 million. Arise also grew its investment portfolio to over USD 694 million and through its nine investees contributed to the provision of more than 1 million Small Medium Enterprise (SME), micro and retail loans across Sub – Saharan Africa, which is set to stimulate local entrepreneurship and contribute to social upliftment. Some key investment highlights during 2017 included Arise’s maiden investment into Cal Bank in Ghana, where it acquired a 28% stake in the bank. “Cal Bank, which is the 3rd largest bank in Ghana has a strong track record of delivering high growth and solid performance and with the support of Arise is well-positioned to deliver future growth in Ghana, one of Africa’s core emerging economies”, said Mr. Malik. Another exciting investment for Arise was the USD 50 million bridging loan that it provided to dfcu Ltd in Uganda. dfcu Bank concluded an agreement with the Bank of Uganda to purchase the assets and assume the liabilities of Crane Bank Limited (CBL), which was in receivership. The acquisition of CBL allowed dfcu Bank to diversify its service offerings to its clients and make banking more accessible to Ugandans and ultimately grow the bank to the second largest in the market. “Arise is proud of these investments, which speak directly to our mandate of investing in Africa’s local prosperity and making banking accessible to all”, he added. 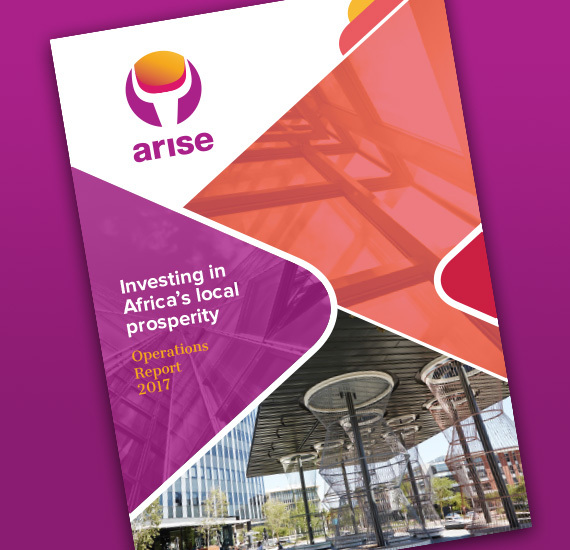 Due to Arise’s impressive financial performance in 2017, the organisation will be able to pay its first dividend to shareholders in 2018. “This is a remarkable achievement for a company its first year of operations and it lays down a solid foundation for the future”, he added. Investing in social upliftment and empowering communities is another strategic priority for Arise and during 2017 significant progress was made in this regard. “Environmental and social considerations are key to the success of our business strategy and we are pleased to report that during 2017, Arise indirectly contributed to 12 407 permanent jobs and 1780 temporary jobs across its investment portfolio”, said Mr Malik. “Promoting financial inclusion and making banking accessible to all is another imperative of Arise and in 2017 we saw a dramatic increase in agency banking with more than 36 000 agencies becoming operational across Kenya, Tanzania and Zambia, through the initiatives of Arise’s investees, namely Equity Bank, NMB and Zanaco”, he said. “Through providing loans and making banking more accessible to the unbanked population, millions of people, some of whom have never had access to finance can now safeguard savings, access working capital, finance small businesses and support the livelihood of their families”, he added. Going forward a key focus for Arise will be to expand its investment portfolio in the next few years to reach its goal of having more than USD 1 billion assets under management. “We look forward to building on the momentum of our first year of operations and to making a tangible impact in terms of advancing economic growth, contributing to poverty reduction and to social upliftment”, concluded Mr Malik.